In the year 2185, 25 year after the first contact between the loroi and the human, a neutral planet was choose to see how a cohabitation of those species would go, Unfortunately the non telepathic nature of human made it quite hard for the loroi to trust human. As a response to the increased in crime and mistrust, a new law system was born! 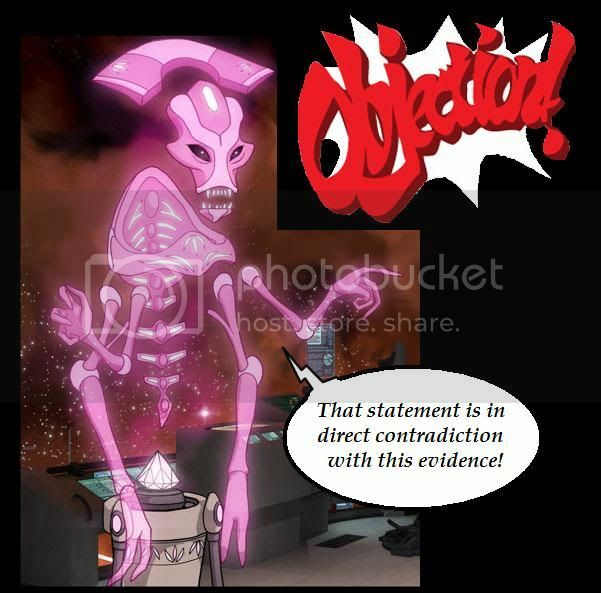 With the need for impartial judge, all turned toward a species that would only receive cold hard fact in order do give an accurate verdict... Up to now this new system proved to be efficient Thanks to the Historian Space Attorney! Enough theatrical, I just wanted to propose a new idea. First let me tell you how i came out with such a concept (that may or may not exist already, i didn't look up and it irrelevant now) For some time now i was playing "pheonix Wright: Ace attorney" when retelling what happened in the game to my family some were Puzzled by the game mechanic so they started to ask question making it clear for me that they thought that the case were build by other player and that the witness were player, like me, who were trying to win the game. At first i laughed and explained them how the game worked but the damage was already done, my imagination took over. For those who haven't played "pheonix wright" i advise you to play it, it a funny logic game but it not important to have played it to understand the idea. Ether way you hear witness and try to find contradiction into their testimonial and show evidence that would point out to the real criminal. That for the basis, What i want to say it that it could be fun to actually make a multiplayer version (via forum) of that game. First we choose a player who would actually be a criminal, he build up a nice little scenario for his crime. This scenario contain a weapon, a motive, a location, a motive and state if have accomplish or outside help (bribe, blackmail, etc). then he talk about it, giving as much detail as possible, to the Game master who question him and take note of hints he could drop around to help pinpoint the criminal. Then the game master go up to a player who actually would be the Police officer. His job is now to describe the crime scene and if there witness describe what they saw, the Police officer take up the most likely suspect and bring him to court. As a witness Witness Basically you just tell what you saw the way you want and/or the way your attorney convinced you to do so. if your related to the crime your best bet would be to falsify your testimony so another one is suspected, but be aware, at least one of the attorney will be against you. The judge being a rater boring character to play will be played by the game master (who already did a lots) His objective is to be impartial and give a verdict when nothing can be added. He also say if an objection is sustained or overruled and put penalty to the attorney if they go to far away in their argumentation. On other words; He is in charge of the well being of the court room Please keep in mind that we aren't lawyer so we will need to set basic rules for this "law system"
Think of the penalty as strike in baseball. for now i haven't set any limit but the way it work is, if you get a certain number of penalty you lose. So if you are defending your client get a guilty verdict, if you were the prosecutor, the defendant is found innocent. after a case is closed another person is choose as a GM and the game restart with another crime. Are you then first GM? Let's keep this stuff in the Outsider forum (unless it's reeeeeeally off topic) so people don't have to go hunting for posts. Well actually Arioch i dont consider it to really be Outsider verse. @bunnyboy, well i tough people would be a little interested with the game. I don't mind being the GM but the important part is really the Criminal. and we still need to draw some basic rules. Neither is the discussion about the Messenger probe, but anything that was appropriate for the old forum (SF, science, art/writing/craft) is fine for this one. We don't have enough activity at the moment to require more than one category. I'll lock the other category until such time as it's needed, so it doesn't confuse people.